A collection of pieces by Bo Joe. Bo Joe and his father, Oreland Joe, will be showing their new work at Claggett/Rey Gallery in Vail on Saturday, Feb. 18. What: Oreland and Bo Joe. When: 3 to 6 p.m. Saturday, Feb. 18. Where: Claggett/Rey Gallery, 100 E. Meadow Drive, No. 7, Vail. Cost: Admission is free; artwork available for purchase. More information: Call 970-476-9350, or visit www.claggettrey.com. VAIL — Oreland and Bo Joe are father and son, artists who reach to their native heritage of Southern Ute and Navajo for inspiration in a contemporary way. Oreland Joe is primarily known as a sculptor in stone and clay but is also a painter and jeweler. Working through multiple mediums, he is able to communicate his stories. 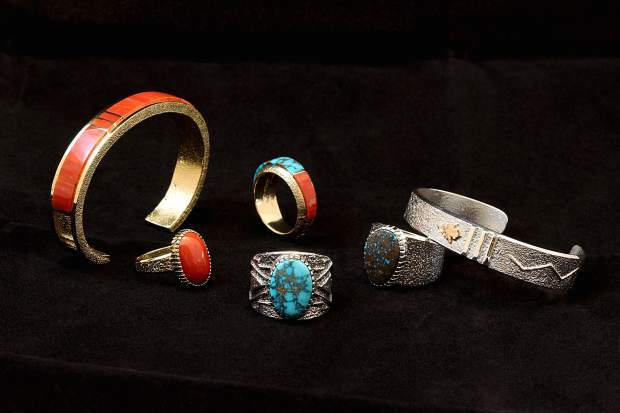 Bo Joe is a master jeweler who creates using traditional techniques of the Navajo heritage — sculpting designs in tufa stone and using the mold to cast silver, gold or platinum, which become pieces of contemporary jewelry adorned with fine-quality stones. Each new piece tells a story, and each has a deeper meaning. “It is always wonderful to be drawn to the beauty in a piece of fine art or fine jewelry, and it is wonderful when you are able to visit with the artist to hear the stories and inspiration behind a piece you are drawn to,” said Bill Rey, of the Claggett/Rey Gallery. Both artists, father and son, have traveled far and wide and bring their broader perspective back to their studios near Shiprock, New Mexico. Oreland Joe is a member of the Cowboy Artists of America, where his unique take on the Native American culture has garnered him many honors. He also exhibits at many museum shows throughout the country; including the Prix de West Show at the National Cowboy & Western Heritage Museum and The Masters of the American West Show at the Autry Museum of the American West in California. He has also shown at the Gilcrease Museum in Tulsa, Oklahoma. Bo Joe moved into the music world as a sound producer for the Smashing Pumpkins, where being creative, pushing the limits and using his expertise on the forefront of the modern music world were a passion for several years. Living in Los Angeles and Chicago brought a broader perspective back to the quiet calm of his studio in New Mexico. Today, Bo and Oreland Joe travel to shows where they are both featured, such as the Heard Museum Guild Indian Fair and Market in Phoenix and the Indian Market in Santa Fe, New Mexico. This weekend, Oreland and Bo will be featured at Claggett/Rey Gallery at the Village Inn Plaza in Vail Village. Both artists will be setting up at the gallery this afternoon, and there will be an opening on Saturday from 3 to 6 p.m. All are welcome to mix and mingle with the artists, with Silver Oak Cellars and Twomey wines from the Napa Valley. Visit http://www.claggettrey.com for more information.